Russia moves to set aside $50 billion award to Yukos shareholders | Russian Legal Information Agency (RAPSI). MOSCOW, November 12 (RAPSI, Vladimir Yaduta) – Russian authorities move to set aside a ruling of the Hague's arbitration court which ordered Russia to pay $50 billion in damages to shareholders in now-defunct oil giant Yukos, director of Group Menatep Limited (GML) Tim Osborne told RAPSI on Wednesday. "I can confirm that the Russian authorities have served papers commencing an action to have the ECT Arbitration Awards set aside. The case will be before the District Court in The Hague," Osborne said. 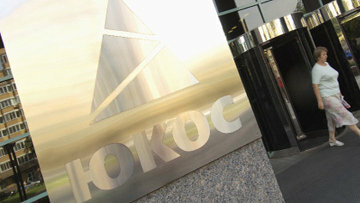 Notably, the Strasbourg-based European Court of Human Rights later in July awarded former Yukos shareholders 1.9 billion euros (about $2.6 billion) in damages. They alleged that Russia had unlawfully seized its assets.